For many years now, we have adopted habits and developed work styles that are detrimental to our emotional, mental, and physical health. This has impacted our performance and engagement negatively. More than ever, it is crucial to find long-lasting solutions and new ways to increase efficiency in the workplace. The problem is not that we are not working hard enough or that we are bad workers. It is that our work styles conflict with what our bodies and mind require at a fundamental level. We have placed so much focus on work, that we have taken our health and wellbeing for granted in a way that is entirely counter-productive. Although we are only starting to engage in more proactive action now, we have always known the tremendous amount of impact employee health has on overall company performance. Poor employee health can cost your business tons of money, including additional medical costs, time off work due to sickness, and lost productivity. Add the cost of less interest in work, less energy, and lower morale, and you are faced with an unbelievable increase in employee turnover and further decrease in productivity. Companies that consider their employees’ health, on the other hand, enjoy many benefits. For one, they become more attractive to potential candidates, making them much better performers compared to their counterparts who ignore employee health. 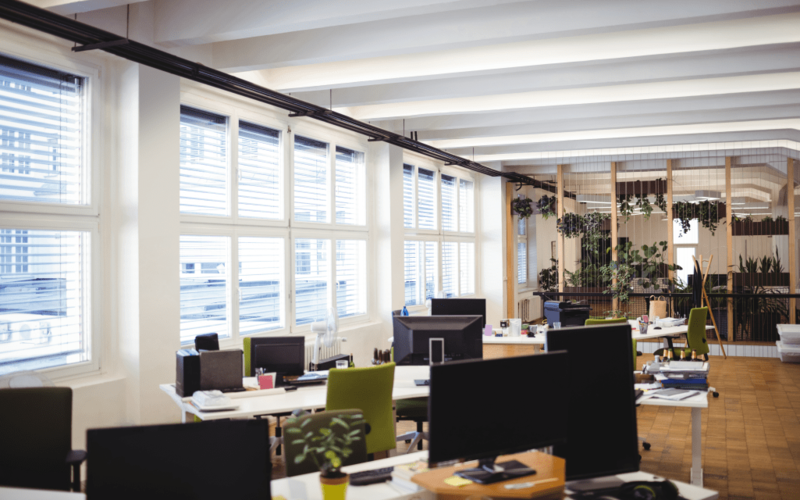 The fact that modern workplaces are beginning to develop an interest in eliminating the detrimental effects associated with poor employee health is a good sign that we are moving in the right direction. In a similar vein, extensive efforts to institute new features and policies to promote employee health reignite the hope of achieving a healthy work environment. From stand up desks, to walking treadmills, to drafting chairs, to stand up desk stools, to footrests, and the like, our workplaces are slowly but surely leveraging modern tools to create the healthiest work environments. This article delves into the 5 best modern things to make people healthy in the workplace. A walking treadmill is a piece of equipment that lets you work and walk at the same time. Rather than sit throughout the day, a walking treadmill lets you work out while you continue to get things done. Consequently, you get to burn plenty of calories and improve your physical and mental health. Sitting for extended periods is known to cause certain cardiovascular diseases, type 2 diabetes, coronary heart diseases, and back problems. That’s why it’s essential to incorporate walking into your schedule. You could take time off work and go out for a walk, but that would mean you would get less work done. An under desk walking treadmill allows you to continue working as you work out. A walking treadmill shouldn’t be confused with your regular treadmill. There are several differences between the two. For starters, your regular treadmill is designed with two support arms on its side and has a console in front of it, which you can use to rest your arms. 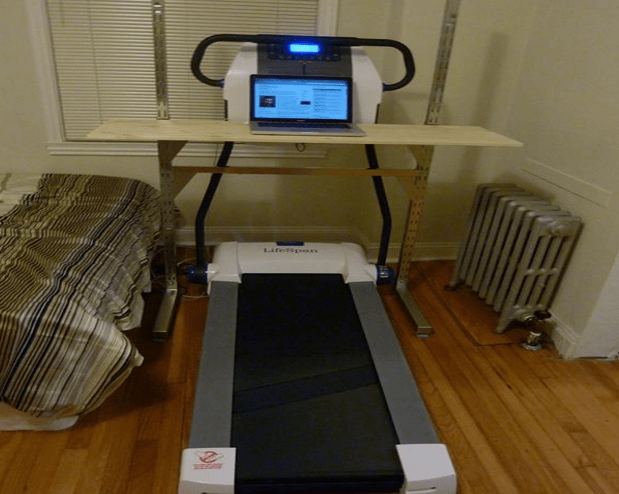 A walking treadmill, on the other hand, doesn’t have arms on the side because it is designed to fit under a stand-up desk. It, however, has a portable console that you can place on top of your desk. The console displays your workout stats and lets you adjust settings. Furthermore, it has a USB port, which you can use to charge your mobile device. Some of the best walking treadmills include the LifeSpan TR1200 – DT3, LifeSpan TR5000 – DT3, Titan Fitness, and more. Sitting at your desk for hours on end makes you prone to suffering from all sorts of pains and aches. That’s precisely where footrests come in. A proper footrest complements your stand up desk well and helps you to overcome potential back, hip, or leg discomfort that result from exposure to an inactive work lifestyle. 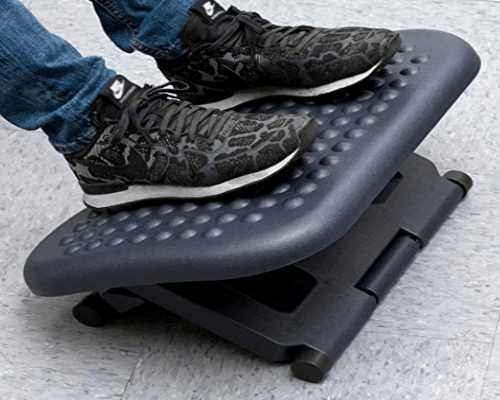 A footrest helps keep your feet propped up, thus promoting better circulation, decreased strain on the spine through improved posture, and increased support for your legs and feet. A footrest that does all these things is considered the best pick. It should be efficient, comfortable, and include some kind of non-slip grip for enhanced stability. Besides, it should be capable of adapting to almost any environment. The ideal footrest is easy to adjust in terms of height and slides beneath your desk effortlessly. It lets you bid goodbye to painful days in the workplace and welcome a healthier, more productive work environment. Another advantage of using footrests that is often overlooked is its suitability for use by shorter people. It lets these users enjoy the advantages of ergonomic seating without being limited. Usually, to enjoy the maximum benefits of using an ergonomic chair, you have to place your feet flat on the floor when seated. That’s often a challenge for shorter people. Thanks to a footrest, though, shorter people can keep their weight properly distributed and their feet flat, even when the chair can’t be adjusted low enough to let their feet touch the floor. There are all kinds of footrests available in the market: from the most modern to the more traditional. There are foam footrests with extra comfort, inflatable footrests that you can also use as travel pillows, and a hammock footrest that goes with any desk. Too much sitting can be detrimental to your health. It can increase your chances of developing thrombosis or blood clots, cardiovascular disease, and diabetes. Studies show that those who sit too much are 54 percent more likely to develop a heart attack. Also, men who sit for more than six hours a day witness a 20 percent higher mortality rate. Women, on the other hand, witness a 40 percent higher mortality rate. Furthermore, studies show that regular exercise does not combat the effects of prolonged sitting. The best way to do away with the negative impact of prolonged sitting is to avoid it. That’s where a standing desk comes into the picture. Standing enables your body to move and adjust easily. This improves your blood circulation, regulates your blood sugar, and lowers your blood pressure. 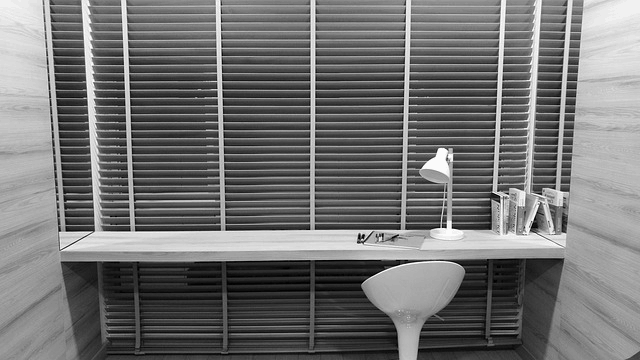 Standing desks come in various shapes, sizes, and functionalities. They give you the chance to switch between sitting and standing positions throughout your workday, so you can avoid the negative impact of too much sitting or too much standing. Standing desks are increasingly becoming popular in the ergonomic space, and rightfully so. But to enjoy maximum benefits, you must ensure you are using stand-up desks correctly. Furthermore, you should ensure you only settle for the best product. Is it spacious enough? Is it is stable? How much weight can it support? How long will it last? These are some of the questions you should ask yourself before making a purchase. The SmartDesk 2 – Business Edition and SmartDesk 2 –Home Edition by Autonomous are right up there with the highest quality standing desks. These stand up desks have managed to stay ahead of the competition because of their spectacular features that appeal to the user’s needs, wants, and preferences. They are designed to promote a healthy work lifestyle. Take the SmartDesk 2 – Business Edition, for example. It is a fully adjustable, electric stand-up desk that provides you with efficiency and extra power. No wonder it is the number one choice of many companies all around the world. It has a 300 lbs. lifting capacity, so you can be sure that it will support all your tools and accessories. Furthermore, it features dual motors that allow for a smooth, quick rise when you adjust the desk. Its extra-large 71” top provides you with plenty of space. The SmartDesk 2 – Home Edition doesn’t disappoint either. It features a powerful motor that gives it a lifting capacity of 220 lbs. and comes with a programmable button interface that allows you to configure up to 4 custom presets, spacious 52” wood top, and more. An ergonomic chair is specifically designed to keep you comfortable while you work, so you can focus on delivering the best possible work output. 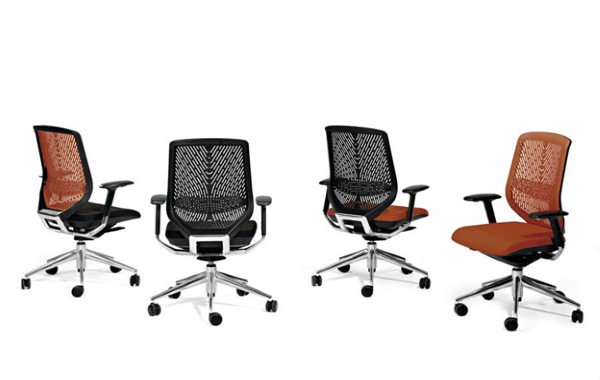 Ergonomic office chairs are designed to reduce physical effort and discomfort, thereby maximizing efficiency. One of the major benefits that an ergonomic chair has over your regular, standard office chair is the level of back support it provides. Although all office chairs are designed with a small pad for the back, ergonomic office chairs normally come with both lumbar support and classic backrest. These features aid in absorbing shock and keeping the spine straight, thus limiting the amount of stress your back is subjected to throughout the day. Ergonomic chairs are designed based on the idea that making work more comfortable increases the efficiency of the workers. Take maintenance and repair costs into consideration: Ask the manufacturer how often you should carry out an inspection and what items you should inspect for. One chair cannot be suitable for every activity: for instance, a dentist cannot use the same chair a computer operator or industrial worker uses. Measure your height: the optimal seat height is about one-quarter of your body height. Seat height range: make sure the seat height is adjustable to the height recommended for the users the seat is meant for. Adjustability: the seat height should be adjustable. Seat depth: the seat should accommodate both the shortest and tallest users. Backrest: A good chair should allow you to adjust the backrest vertically, backward, and frontward. Stability: examine the stability of the chair. A 5-point base is usually the most suitable. Top products in this category include the ErgoChair 2 by Autonomous, Midback Mesh Chair by Flash Furniture, Embody Chair by Herman Miller, and more. Too much sitting or too much standing can be detrimental to your health. That’s where stand-up desk stools come into the picture. They give you the best of both worlds while mitigating the challenges encountered. Recent studies show that prolonged standing and sitting affects metabolism and can result in obesity. You may also develop improper body posture. Stand up desk stools complement your height adjustable desk to offer you a healthy work environment that inspires productivity and focus. Acquiring a good stand up desk stool in the office or at home is a crucial step toward promoting your wellbeing. In addition to developing proper body posture, you also get to reduce the risk of cancer, obesity, cardiovascular diseases, and more. Preventing these diseases and regulating imbalances helps increase mortality. To enjoy the maximum benefits of standing desk stools, you need to ensure you get the right one. With myriads of options available in the market, it is often easy to get overwhelmed. The secret to landing the most suitable stool lies in defining factors such as stability, design, quality, seat comfort, height adjustment, and overall value. Most importantly, you should focus on establishing your own needs and wants, so you can land a product that offers you the utmost satisfaction. 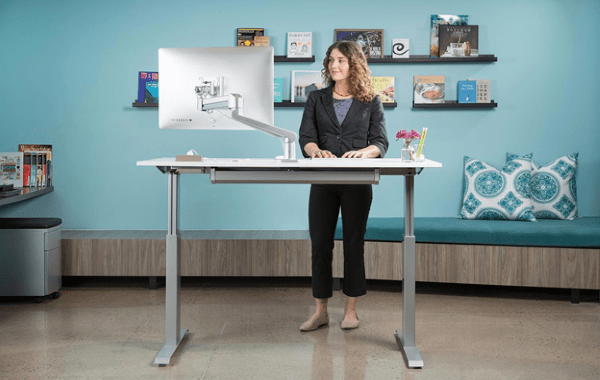 Some of the best standing desks you should consider include the Focal Locus Seat, Varier Move, Aeris Muvman, Focal Mogo, Varidesk Varichair, Uncaged Ergonomics Wobble, Learniture Stool, and more. They say health is wealth. This statement is as true in the workplace as it is in any other place. When workers are in good health, they perform better. Consequently, the business gets to grow. And what better way to ensure this, than to leverage the best modern tools. The above-mentioned tools have changed the workplace for the better as far as health is concerned. Don’t be left behind. Incorporate them into your workplace, and you won’t be disappointed.